Orville Ray HOLLINGSWORTH [Parents] was born on 10 Nov 1886 in Quinter, Gove, Kansas. He died on 1 May 1976 in Bellingham, Whatcom, Washington. Orville married Edith W..
Edith W. was born about 1883 in England. Edith married Orville Ray HOLLINGSWORTH. Danny Joe HAYNES. Danny married Brandy Nichole GRIFFIN on 6 Apr 1996. Brandy Nichole GRIFFIN [Parents] was born on 6 Dec 1975 in Ada, Pontotoc, Oklahoma. Brandy married Danny Joe HAYNES on 6 Apr 1996. Zachary Lane GRIFFIN was born on 7 Aug 1994 in Ada, Pontotoc, Oklahoma. Abner Otis SUTTON [Parents] was born on 17 Sep 1902 in Indian Territory, Oil Center, Pontotoc, Oklahoma. He died on 25 May 1984 in Valley View Hospital, Ada, Pontotoc, Oklahoma. He was buried on 28 May 1984 in Maxwell Cemetery, Maxwell, Pontotoc, Oklahoma. Abner married Opal Reeves BLACK on 5 Jan 1946 in Ada, Pontotoc, Oklahoma. Opal Reeves BLACK was born on 29 Jan 1919. Opal married Abner Otis SUTTON on 5 Jan 1946 in Ada, Pontotoc, Oklahoma. Grant ISAACS [Parents] was born on 2 Feb 1894 in Maxwell, Pontotoc, Oklahoma. He died on 5 Aug 1976 in Ada, Pontotoc, Oklahoma. He was buried on 8 Aug 1976 in Maxwell Cemetery, Pontotoc, Oklahoma. Grant married Mary Beatrice SUTTON. Mary Beatrice SUTTON [Parents] was born on 19 Feb 1904 in Oil Center, Indian Territory, Pontotoc, Oklahoma. She died on 9 May 1933 in Oil Center, Pontotoc, Oklahoma. She was buried on 12 May 1933 in Maxwell Cemetery, Pontotoc, Oklahoma. Mary married Grant ISAACS. M i J. D. ISAACS was born on 19 Jun 1917. He died on 28 Oct 2002. M ii Joe Edward ISAACS was born on 28 Oct 1920. He died on 1 Jan 2001. James William ISAACS was born on 27 Feb 1933 in , Pontotoc, Oklahoma. He died on 15 Jul 1994 in Stratford, Garvin, Oklahoma. William Pleasant SUTTON "Sr." [Parents] was born on 19 Nov 1906 in Oil Center, Indian Territory, Oklahoma. He died on 14 Dec 1982 in Local Hospital, Ada, Pontotoc, Oklahoma. He was buried on 16 Dec 1982 in Rosedale Cemetery, Ada, Pontotoc, Oklahoma. William married Myrtle Mae KIRBY on 30 Nov 1927 in Rev. Walker's House n.Worstell, Pontotoc, Oklahoma. Myrtle Mae KIRBY [Parents] was born on 17 Dec 1907 in Walnut Grove, Bebee, Pontotoc, Oklahoma. She was christened in Pentecostal Holiness Church. She died on 9 May 2004 in Ada, Pontotoc, Oklahoma. She was buried on 12 May 2004 in Rosedale Cemetery, Ada, Pontotoc, Oklahoma. Myrtle married William Pleasant SUTTON "Sr." on 30 Nov 1927 in Rev. Walker's House n.Worstell, Pontotoc, Oklahoma. M i William Pleasant SUTTON "Jr." was born on 4 May 1929. He died on 18 Apr 2005. M ii Donald Edward SUTTON was born on 17 Nov 1932. He died on 14 Sep 2008. Elbert Lee LITTLE was born about 1907. He was buried in Maxwell Cemetery, Pontotoc, Oklahoma. Elbert married Beulah Gertie SUTTON on 27 Mar 1927. Beulah Gertie SUTTON [Parents] was born on 17 Jul 1909. Beulah married Elbert Lee LITTLE on 27 Mar 1927. M i Vawter LITTLE was born about 1928. Paul Edward LITTLE was born about 1930. Hansel Earnest BURK [Parents] was born on 8 Jul 1911 in Eureka Springs, Carroll, Arkansas. He died on 22 Aug 1990 in Ada, Pontotoc, Oklahoma. Hansel married Floy Lillian SUTTON on 1 Sep 1928 in Oil Center, Pontotoc, Oklahoma. Floy Lillian SUTTON [Parents] was born on 12 Jun 1912 in Ada, Pontotoc, Oklahoma. She died on 3 May 1997 in Ada, Pontotoc, Oklahoma. Floy married Hansel Earnest BURK on 1 Sep 1928 in Oil Center, Pontotoc, Oklahoma. F i Thelma Jean BURK was born on 29 Apr 1929. She died on 3 Nov 2010. 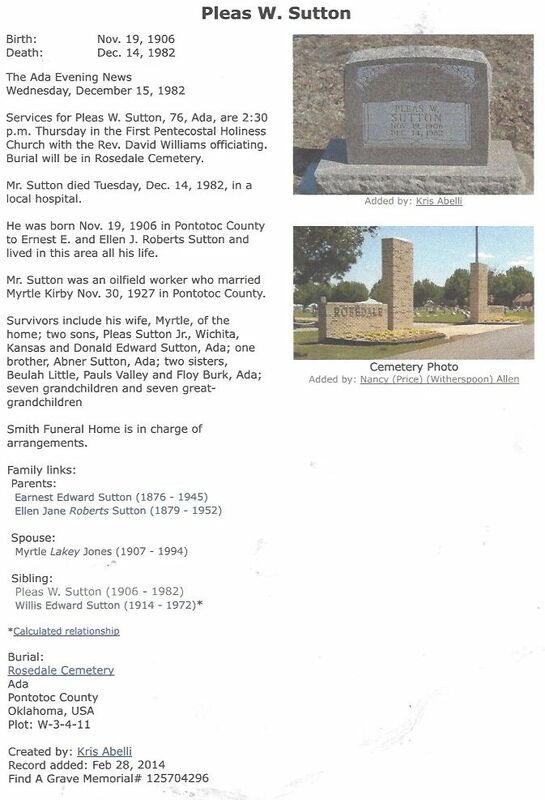 Willis Edward SUTTON [Parents] was born on 5 Jul 1914 in Ada, Pontotoc, Oklahoma. He died on 13 Feb 1972 in Ada, Pontotoc, Oklahoma. He was buried on 17 Feb 1972 in Maxwell Cemetery, Pontotoc, Oklahoma. Willis married Verdie Ruth SOWARD. Verdie Ruth SOWARD [Parents] was born on 7 Apr 1915 in , , Oklahoma. She died on 31 Aug 1985 in Ada, Pontotoc, Oklahoma. She was buried in Sep 1985 in Maxwell Cemetery, Pontotoc, Oklahoma. Verdie married Willis Edward SUTTON. M ii Gerald Edward SUTTON was born on 3 Sep 1938. He died on 19 Sep 1984. Joe Edward ISAACS [Parents] was born on 28 Oct 1920 in , Pontotoc, Oklahoma. He died on 1 Jan 2001 in Ada, Pontotoc, Oklahoma. Joe married Joyce. Joyce. Joyce married Joe Edward ISAACS. J. D. ISAACS [Parents] was born on 19 Jun 1917 in , Pontotoc, Oklahoma. He died on 28 Oct 2002 in Chino, San Bernardino, California. J. D. ISAACS married Pauline. Pauline. Pauline married J. D. ISAACS.